Yet we also haven’t really seen that happen in our lifetime. The multiplication system often breaks down after the first split. Josh Hunt has a system that churches can use that breaks out of the cycle of aborted multiplication. He has written about it, and as a pastor, he has used it, and has recorded video testimony of several churches that have implemented his You Can Double material. Josh is nationally known for his ability to lead churches to double their small group attendance. Josh Hunt is the new pastor of Salem Baptist Church in Salem New Mexico. Hunt has been a Minister of Education in addition to consulting nationwide. He also writes Sunday School helps in a format he calls Good Question which he publishes on the Internet to correspond with two of Lifeway’s curriculum outlines. Hunt is a graduate of Southwestern Baptist Theological Seminary and Wayland University. Hunt’s a creative thinker and an energetic speaker whose passion is to see people come to know and enjoy God. He has spoken at some of the leading churches in America, has authored 7 books and produced 7 video series. Josh joins the EvangelismCoach Webinar series to discuss practical ways you can DOUBLE OUR GROUP SIZE so our churches will grow. Josh has written and continues to produce question sheets. You can purchase a subscription as an individual, or an annual subscription for your church. Josh has written several good books. 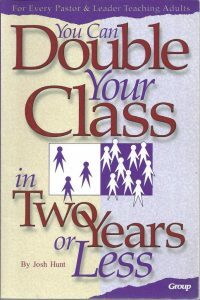 The one featured in our webinar is You Can Double Your Class in Two Years or Less. Order your copy direct from Amazon. As you prepare for your fall programs, is your first impressions ministry in order? 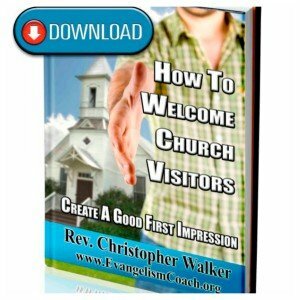 Buy and download my book How to Welcome Church Visitors. You can start putting those ideas into place immediately after download. Note: The breathing over Josh disappears about a few minutes into the webinar, I had a supersensitive microphone. Good webinar. I found it refreshing how simple Josh’s strategy is and how pretty much any group can do it. It doesn’t require people to be super gifted in any way. I’ll forward a link to the dir of small groups of my church as soon as you’ve got the video of the webinar up.